Decimal representation worksheets are much useful to the kids who would like to practice problems on decimals and rational numbers. Before we look at the worksheet, let us come to know some basic stuff about "Decimal representation"
If we have a rational number written as a fraction p/q, we can get the decimal representation by long division. When we divide p by q using long division method either the remainder becomes zero or the remainder never becomes zero and we get a repeating string of remainders. Let us express 7/16 in decimal form. Then 7/16 = 0.4375. In this example, we observe that the remainder becomes zero after a few steps. Also the decimal expansion of 7/16 terminates. 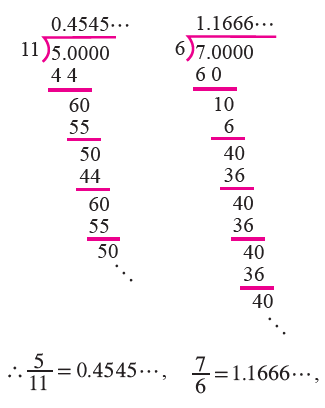 In the above examples, the decimal expansion terminates or ends after a finite number of steps. Does every rational number has a terminating decimal expansion? Before answering the question, let us express 5/11 and 7/6 in decimal form. Thus, the decimal expansion of a rational number need not terminate. In the above examples, we observe that the remainders never become zero. Also we note that the remainders repeat after some steps. So, we have a repeating (recurring) block of digits in the quotient. To simplify the notation, we place a bar over the first block of the repeating (recurring) part and omit the remaining blocks. So, we can write the expansion of 5/11 and 7/6 as follows.. 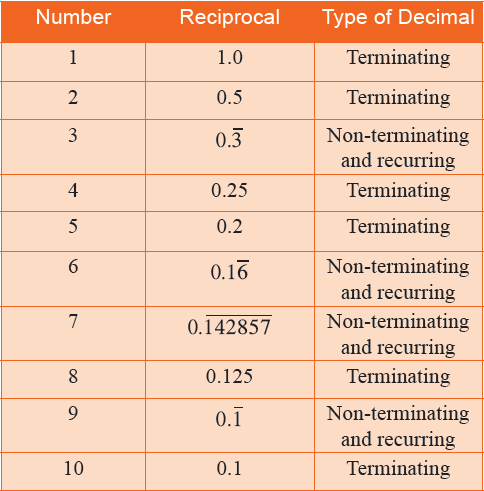 The following table shows decimal representation of the reciprocals of the first ten natural numbers. We know that the reciprocal of a number n is 1/n. Obviously, the reciprocals of natural numbers are rational numbers. A rational number can be expressed by either a terminating or a non-terminating and recurring (repeating) decimal expansion. The converse of this statement is also true. That is, if the decimal expansion of a number is terminating or non-terminating and recurring (repeating), then the number is a rational number. Express the following rational numbers as decimal numbers. After having gone through the stuff given above, we hope that the students would have understood "Decimal representation worksheets"
If you want to know more about "Decimal representation of rational numbers", please click here.